The Cubs have sustained a fairly large amount of roster turnover so far in 2017. 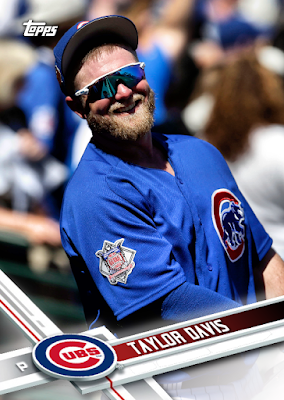 Once the recently recalled Taylor Davis makes his debut, they will have used a total of 46 players during the current campaign. As it stands, there's simply no way that Topps Flagship set is going to be able to cover everyone (not that they would anyway) - not even with assists from the factory team sets and Opening Day. Seeing as I have a 2017 template already built and ready to use, I figured I'd take the liberty to help the ol' bubblegum company out. I'm always happy to assist. This is actually an addendum - my "update" series if you will (for part one, click here). With the end of minor league season, the September call-ups made, and the playoff roster cut-off passed, I doubt we'll being seeing any more names added to the all-time roster this year. Time to finish up the checklist. Last time through, I honestly forgot to include Mr. Anderson - I guess that's what happens when you only last 6starts and post an ERA over 8 in that time. 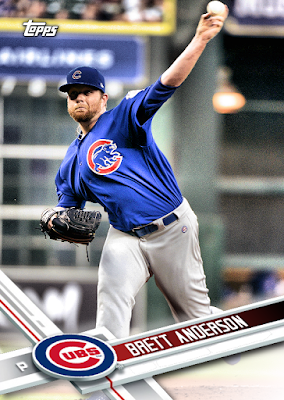 Nevertheless, a Cub is a Cub, no matter how ineffective; so, here's what will likely be the only Cubs card of Brett Anderson ever "produced." Yea... he seems a tad bitter. Sorry it didn't work out Brett; I guess you won't be bummed about your Cubs tenure being ignored by real baseball cards. Here we have a pair of Cubbie catchers, Rene Rivera and the aforementioned Taylor Davis. 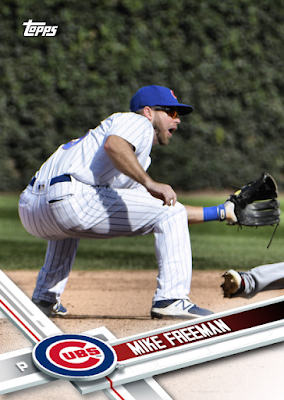 Again, neither of these likely short-term Cubs are likely to appear on an authentic Topps single. 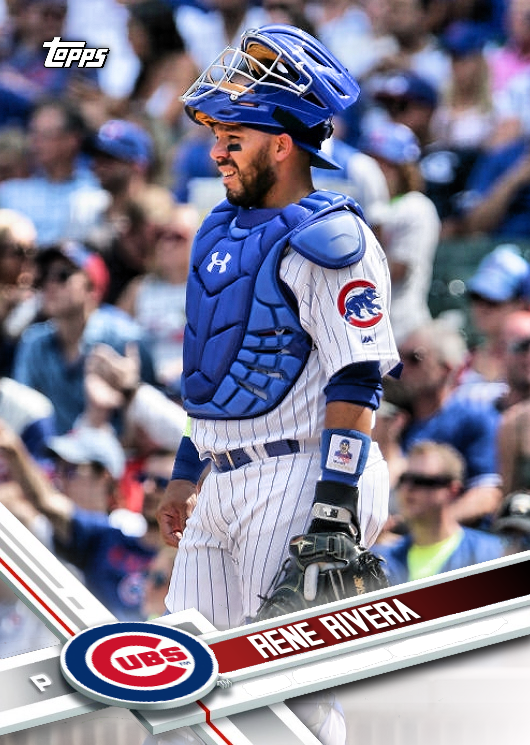 After all, Rene is an injury stopgap for the soon-to-be returning Willson Contreras (third-string catchers don't concern Topps) and Taylor Davis is honestly a non-prospect being rewarded for being a team player and good employee. 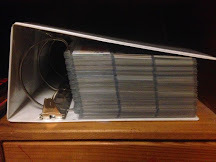 Topps may ignore such players, but not Wrigley Roster Jenga! Here we have another injury-necessitated addition, Mike Freeman. 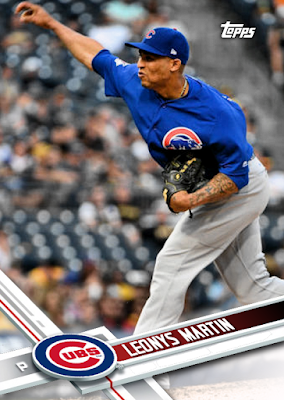 The journeyman was signed to be AAA depth at shortstop and when Addison Russell's rehab was set back three weeks, that depth was absolutely needed. Without Addy's plantar fasciitis problems, Mr. Freeman is sitting at home right now. In retrospect, with this photograph selection, this card would have been better suited as a horizontal piece. As it stands, Mike looks like he's freaked by a spooky, disembodied foot materializing in front of him. Oh well - hindsight is 20/20, I suppose. To conclude, we have a pair of pitchers... okay... well, only one is the real McCoy. 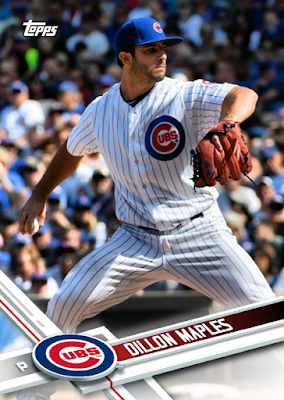 Dillon Maples is a late blooming relief prospect, with a knockout breaking ball and a triple-digit fastball, who's looking to force his way into the 2018 bullpen. Leonys Martin is a all-glove, no-hit extra outfielder who was acquired in a minor trade to serve as a defensive replacement and pinch-runner. So, naturally, his first (and, so far, only) appearance came on the mound during a blowout loss. You just never know what's going to happen when your ballclub is skippered by Joe Maddon. With that, all of the 2017 Chicago Cubs are officially accounted for. Yay!!! Topps - if you want to go ahead and just pirate my work to pad out the Update set, I think I'd be okay with that. Those look great. 0-0 top of the 9th as a write. MIL lost. We could really use this one. I was wondering why the Leonys Martin picture looked odd. Maybe the Mariners should have kept him given our starting pitching injury woes.